These Byzantine Christmas Tree Light Earrings are festively fun. These Byzantine Christmas Tree Light Earrings are festively fun and will add a bit of whimsy to your holiday outfit. These Byzantine Christmas Tree Light Earrings are festively fun and will add a bit of whimsy to your holiday outfit. 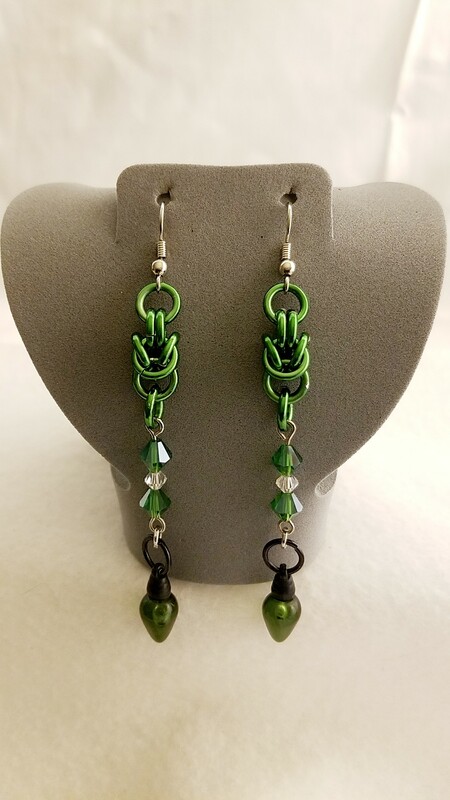 Made with Green anodized aluminum rings in the chain maille weave byzantine, crystals and a charming green Christmas tree light on the end your outfit will get a bit of extra festive to it. 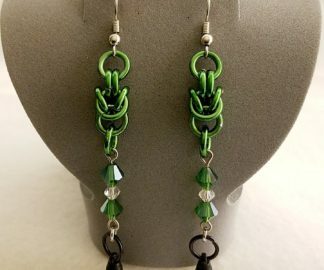 The Byzantine (BIZ-ann-teen) Weave -is in the European family of chain maille weaves. It creates an ornate rope that looks very exotic. Crystal beads- Quite simply they are glass crystal beads. By cutting the glass in just the right way, internal reflection from inside the shiny surfaces of the glass causes the light to reflect internally. This internal reflection results in sparkle as the glass is tilted, adding to its beauty. 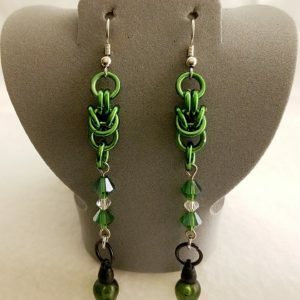 If you would like to know more about the gemstones, rings, and items that are used in making handmade items like this, Byzantine Christmas Tree Light Earrings; please take a look at the Material Description Page and my Chain Maille Descriptions page.